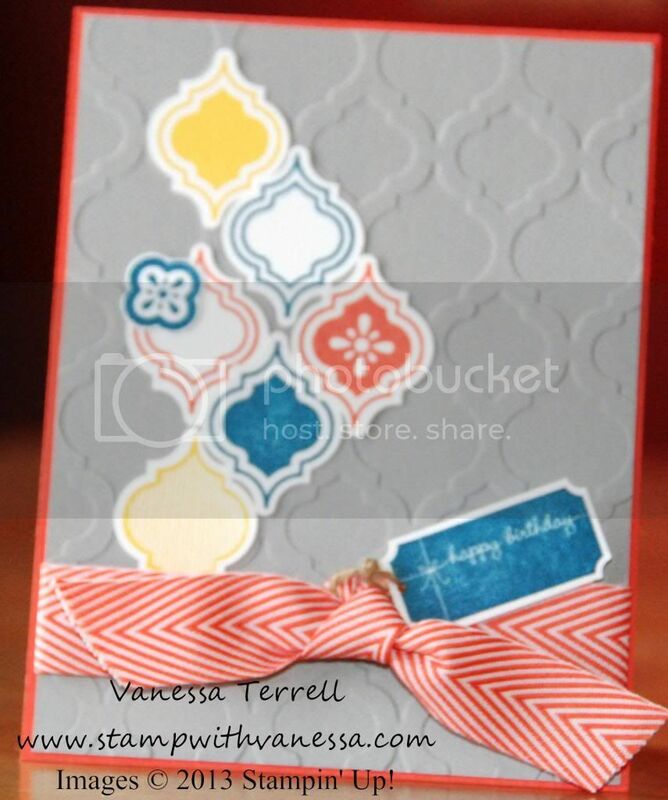 Today I'm sharing with a card made with products from the soon to be released catalog. As a demonstrator we are able to pre-order new products from the catalog before it is released. I love this perk! We also get to see the catalog ahead of time! I'm sharing with you today the new Mosaic Madness stamp set and it's coordinating punch, and embossing folder as well as one of the new colors and a new accessory! Wow...quite a bit packed into one card! Love this stamp set and the embossing folder, but what I'm really loving is this new ribbon. I can't wait to get my hands on more of this stuff. This is our new Chevron Ribbon and it will come in several new colors...did I say that I love it? The color that I'm using is Calypso Coral. Join my team and you too can take advantage of the pre-order...need more information just send me an email and I'll be happy to help you. Plus right now you get $30 more FREE stuff in your kit!